The money collected from the new student fee will go towards the creation of a fund that will be donated to schools and health care programs in Louisiana, where 4,000 known descendants of the 272 Georgetown slaves now reside. 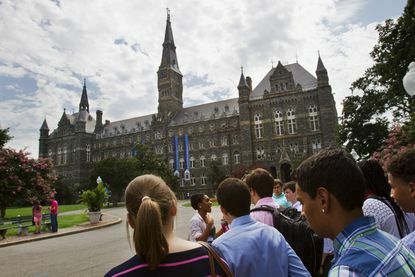 Georgetown University may become the first US school to charge a fee to pay reparations to descendants of former slaves. On Thursday, the students voted by a large margin in favour of a referendum seeking the establishment of the fund. The fund would be the first of its kind in the country. Those students say the $27.20 fee would generate over $400,000 a year and would "be allocated for charitable purposes directly benefiting the descendants of the GU272 and other persons once enslaved by the Maryland Jesuits". The referendum isn't binding, however, and would still need to get the OK from the university's board of trustees. "There are many approaches that enable our community to respond to the legacies of slavery", the statement said. The slavery case dated back to 1838 when the Jesuit university made a decision to sell the slaves to plantations in Louisiana to pay off debts, in a deal worth the equivalent of $3.3m.